The Winter People by Jennifer McMahon. When I heard about this book it sounded like a good mystery. After all a 100 yr. old diary is found which contained a mystery! Hey what's not to like? However, I am not into "living dead" or "zombie" books and this had some of the "living dead" in it. That did not thrill me, and the fact that it covered 100 yrs was a bit confusing to me. But... (there's always a but, right?).. the mystery was a good one and a number of twists and turns, right up to the very end, all contributed to my not setting the book aside. I will say, I liked it. Not something I will read over again, but a change from my usual reading and obviously interesting and written well enough for me to read the entire book. I think to most who don't mind a bit of living dead (and I know there are many out there) that this would be a really good read for you. With this book it brought my count of books read in February to 7 ! Last month and this month were good reading months for me. I doubt this will keep up but as long as I am reading something it's a good thing! I think of the books read this month my favorite was Risking it all by Ann Granger.. however, Touchstone is right up there with it! Ann Granger's Fran Varady novels take us to the streets of today's London where Fran, a young woman who is constantly struggling to find employment and a place to live, rubs shoulders with friends and foes, tramps, con men, cops, shopowners - and in this case also her dying mother. Yes, this plunges Fran into a round of encounters with strangers all over town, and a dead body on her doorstep, and worse. Except for the fact that Fran is to her residences roughly what Janet Evanovich's protagonist Stephanie Plum is to her cars (a jinx to put it mildly), this was a satisfying and interesting book. 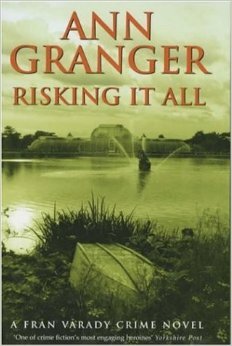 This is my third crime novel by Ann Granger, featuring Fran Varady as the main protagonist. I have to say that I have enjoyed all 3 books, but I think this is my favorite of the three! From the beginning Ann Granger seems to tell a simple story (involving crime solving of course), using simple words, but still manages to turn tables and have surprises while reading. I think I connected with her character of Fran Varady. Not because I ever want to be a detective, or her so called wish to be an actor.. but because her mother left her when she was very young. (my father did the same, I don't have a single memory of him) . Her life was not easy, neither was mine with my mother supporting 2 kids alone. And so there are levels I feel like I know where she coming from. These facts keep anyone rooting for her to go on and yet afraid something bad could happen. This story would have been my dream come true, because in this book, the mother who ran out and never saw her again, found her before she died. She got to meet her mother again. Something I never had the chance to do with my father. It makes me wonder at times, how some of these authors come up with their material. Anyway... The 3 books I've read are: Rattling the Bones, Mixing with Murder, and Risking it All. Good main character, good recurring side characters, easy reading and good stories.. can't ask for much more. Touchstone by Laurie R King. Hailed for her rich and powerful works of psychological suspense as well as her New York Times bestselling mysteries, Laurie R. King now takes us to a remote cottage in Cornwall where a gripping tale of intrigue, terrorism, and explosive passions begins with a visit to a recluse upon whom the fate of an entire nation may rest—a man code-named . . .
Building to an astounding climax on an ancient English estate, Touchstone is both a harrowing thriller by a master of the genre and a thought-provoking exploration of the forces that drive history—and human destinies. I decided to do a reread of a book I haven't read since 2007!.. that's when I received and advance reading copy of the book Touchstone by Laurie R King. The very same author who writes all the Mary Russell (Holmes) books! After I read this the first time.. I saved it. That means I knew I'd want to reread it one day... and it finally happened! And I enjoyed it as much as the first time. When I began the book I quickly remember it had political overtones.. yuck.. the only political books I enjoy are not fiction!.. hmmm, but I saved the book.. so .. I continued to read. And it wasn't long until I was hooked once again! Stuyvesant is an American working for the government, who travels to England to find a man he suspects has set off a number of bombs in America, one of them all but killed his brother, and this was a personal matter. He has come at a turbulent time in England with miners striking and Unions ready to wage war. He is led to a man named Major Aldous Carstairs.. whom you will dislike immediately! And not without reason!.. With Carstairs "help" he is introduced to Bennett Grey (who will steal your heart in one way or another). With Grey's help Stuyvesant believes he can infiltrate the group of people surrounding a man named Brunson, who he believes is the bomber. Grey introduces him to his sister Sarah, (a noticed beauty to Harris), who in turn introduces him to Laura Hurleigh, daughter of a Duke, mistress to Brunsen, and a very highly intelligent and political person herself. I can't begin to tell you all the different turns this story takes! The homework Laurie King must have done to describe every moment in England and every detail of the House of Hurleigh must have been horrendous, because, trust me on this.. you think you are there! I won't even mention the twists and turns that happen at the end of this book! I highly doubt you will figure it out along the way! 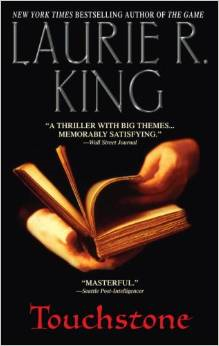 If you are even remotely interested in suspense thrillers, this book is for you! 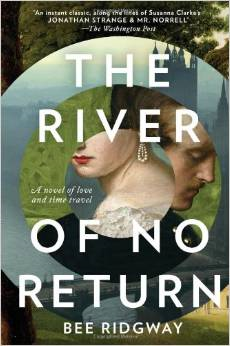 The River of No Return by Bee Ridgway. Time travel to me is sci-fi and as much as I am a sci-fi fan of movies, I am not a fan of reading it. (unless it's kept to a minimum). So I am not sure what it was that kept me reading this book.. up and to 100 pages I was thinking that this book would not be read by me, but something made me wonder where it was going, I guess, and so I read on. There was also a romance in the story.. though not much was done with it until the last quarter of the book. (once again, that was fine with me). I will say that the second half of the book moved faster and decidedly was more interesting. (regardless of the romance). I did like the character of Lord Nick. An important someone in his time, but not nearly as important in the future time. I think his maturing and way of thinking of people in general (common vs aristocrat ) and of woman and their part in the world when he returned to 1815, gave good thought to his character. I liked the book. Not one that I'd read a second time.. and it was "different" for me. But it didn't change my mind about liking to read time travel stories! So I hope the Amazon review tells you enough to know if it is something you might want to read ! There were other reviews on the page if you think you want to know more about the book. 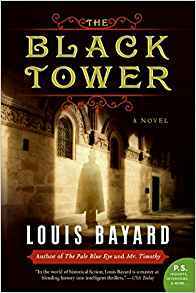 The Black Tower by Louis Bayard. Vidocq! Master of disguise and chief of a newly created plainclothes police force, Vidocq is a man whose name sends terror rippling through the Parisian underworld of 1818—and the inconsequential life of Hector Carpentier is violently shaken when Vidocq storms into it. A former medical student living in his mother's Latin Quarter boardinghouse, Hector finds himself dragged into a dangerous mystery surrounding the fate of the dauphin, the ten-year-old son of King Louis XVI and Marie-Antoinette presumed to have suffered a cruel death years earlier in Paris's dreaded Temple. But the truth of what happened may be even more shocking—and it will fall to an aimless young man and the most feared detective in Paris to see justice done for a frightened little boy in a black tower . . . no matter what the cost. This is my 3rd book by Louis Bayard. And I have enjoyed all three of them! A lot of historical History has gone into his books: The Tower, The Pale Blue Eye and Mr. Timothy. This one begins with a murder. In the dead man's hand is a note that simply states a name, Dr. Carpentier. It turns out Dr Carpentier does not know this murdered man, but subsequently is dragged along by the detective, Vidocq, while he continues to track down the murderer. Bayard takes us back to the time of King Louis XVI, and asks what happened to the apparent heir to the throne. Supposedly he was held in a tower until his death. Or was he? How was Carpentier involved in this? Was the boy dead or alive? And how could they tell if what they suspect is true or not? Toss in another murder or two, question who you trust or don't trust and Bayard has given us yet another very good historical fiction book to read! I know I don't write much of a review, I leave that to the reviews from Amazon, but what I can say is that it was an easy read, and an interesting read. It kept me picking it up each time I sat down and to me... that's an enjoyable read! 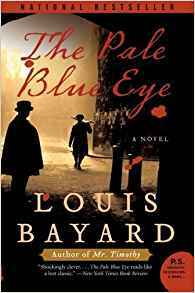 The Pale Blue Eye by Louis Bayard. Starred Review. Bayard follows Mr. Timothy (2003), which brilliantly imagined the adult life of Dickens's Tiny Tim, with another tour-de-force, an intense and gripping novel set during Edgar Allan Poe's brief time as a West Point cadet. In 1830, retired New York City detective Gus Landor is living a quiet life at his Hudson Valley cottage, tormented by an unspecified personal sorrow, when Superintendent Thayer summons him to West Point to investigate the hanging and subsequent mutilation of a cadet. Poe aids Landor by serving as an inside source into the closed world of the academy, though Poe's personal involvement with a suspect's sister complicates their work. But the pair find themselves helpless to prevent further outrages; the removal of the victims' hearts suggests that a satanic cult might be at work. This beautifully crafted thriller stands head and shoulders above other recent efforts to fictionalize Poe. This is my second book by Louis Bayard. The other I read by him is called Mr. Timothy. I have to say I surprised myself by how quickly I read this book. Mainly because the print was on the small side! Sheer horror for me! The Pale Blue Eye managed to grab me right away. I liked the way the author put the history of the West Point Academy into the book, circa 1830. He researched enough to know that Edgar Allan Poe truly did go to West Point for a time and so incorporated as the cadet he chooses to help him solve the crime. Small hints are dropped here and there but I have to admit that I could not figure out who the murder was! And then at the end when the whole story comes out it takes yet another twist which you really don't have a clue is coming! I liked this book a lot, as I also had enjoyed his book of Mr Timothy, which is about the adult "Tiny Tim" of Christmas Carole fame. The retired detective, Gus Landor, was a very good character. You don't actually know much about him but he is such a thorough detective that you find his work more intriguing than he is! (rare for me, I am character driven). As for Poe, I will only say that one of his more famous poems comes to mind over and over again as you read this book.. but you will have to read it for yourself and see if you come up with the same (thought) poem. 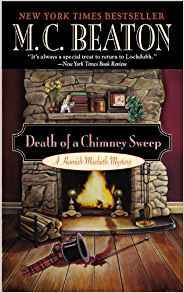 Death of a Chimney Sweep by M.C. Beaton. This is a small , quick read. Although it bounced around nicely, not letting on "who done it".. being a small book it also didn't really let you get to know the characters all that well. I am all about the characters, so it was a bit lacking for me. Being such a small book things happen rather quickly! Yet in other books some things are drawn out more then needed... not sure which is more enjoyable! But there were murders to be solved and lately that seems to keep me reading most any book! I have since found that there are a whole series of these books and so I am guessing that eventually getting to know the characters happens sooner or later!